As I have been researching some advance viewers like Phoenix, Firestorm, Astra, etc… I have found one simple viewer very useful that use on one laptop which doesn’t have the graphics capabilities like my main laptop (I have 2 laptops that I use for different things). This viewer is called as Radegast, I discovered about it when I found a resident using it in a sim and I decided to test it too. “Radegast is feature rich GUI client. With it’s full support for all communication within a virtual world (chat, IM, group IM, friends conference) it’s ideal for situations where full 3D client is less than ideal solution, for example, an office environment, too slow a machine and similar. I found this viewer as very simple to use, I just use it for chat and not any other task (like building). This program can be useful for those who have a less powerful 3d graphics computer. I would suggest this program for those want to be in touch to their friends on the metaverse, but not to enjoy the wonders of the virtual worlds. 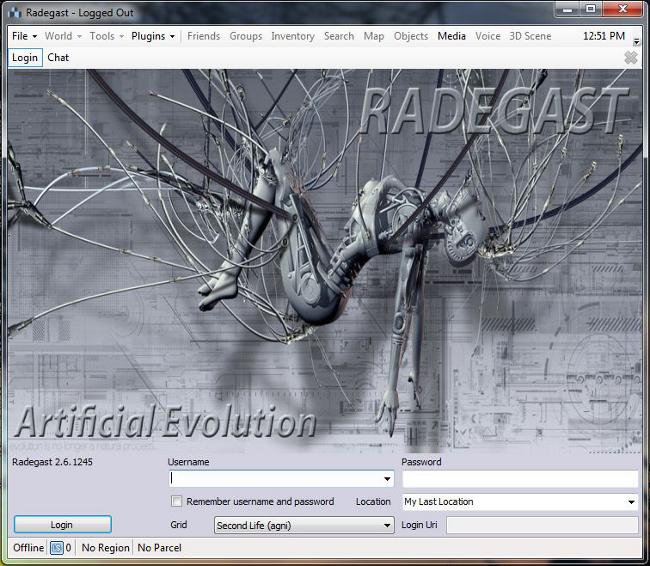 Radegast can be used in Second Life or Opensim. For more information go to: http://www.radegast.org. This entry was posted in Start and tagged Chat on Virtual Worlds, chat program, Metaverse Chat Program, Simple Chat Program on May 30, 2012 by Xpontaneus. I want to dedicate this post to a friend of mine, someone I know for a long time and Recently she got hurt (I take care of my SL Friends). But also I would like to show to somebody else that I am not “Cold and Hard Hatred”. I always avoid to have a relationship or a couple in The Metaverse, this is not the best way to find a partner, so many people just get disapointed with others who don’t are concious that behind any avatar there are feelings that can be broken. But why I have this behaviour ?, in my own opinion this in an illusion or a dream that you can find something (but you get nothing) and living an illusion on the metaverse then I prefer to the Real World. Some Residents come here just for fun and sometimes they don’t get this so serious while other Residents take this game serious like Real Life. There are exceptions and yes, friend of mine found her love (even they got married on Real Life) inworld and that’s nice but it takes time and it is not easy like making friends. Always, you have to be careful and you need to know the person (and make sure that it is a woman or a man on RL) very well, before to do something really serious like engage. It make me smile when I see some new resident (newbies) who comes here and ask: “Who wanna be my partner or who want to get married with me?”. This doesn’t make sense, think about it would you go out to the streets and would you tell to people the same thing?, if you do that then people will think that you are crazy (and in metaverse residents will think the same way). 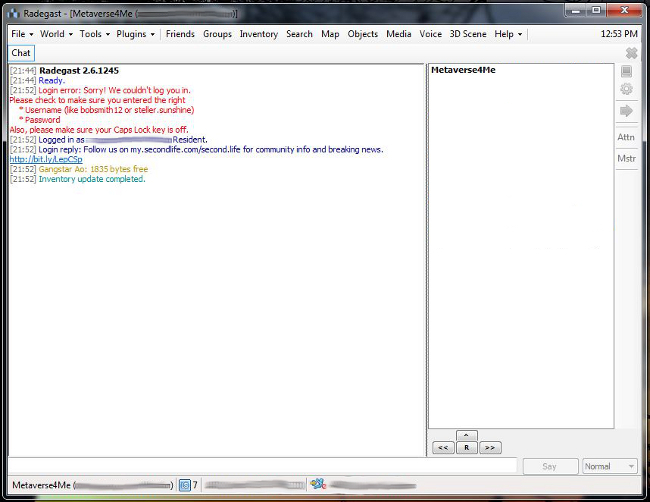 One time I met a Avatar Woman (I supposed she was) that sent to me a IM asking to meet in another chat program. The first answer I just gave to her is that I never trust to people at first time, and the second answer was to choose another way to find a partnet, the internet is not safe for it. For those who are on the metaverse looking for love or a partner, nothing can’t be compared like in Real Life. Real Love is manythings , the most important is physical contact (i mean a hug, a kiss and affection) and to have that person near you. Love behind a Computer is like a watching a movie, it is a illusion and a dream. So just remember, this is a game so don’t put your feelings on it (maybe someone can hurt you). This time I was speaking with a Vampire, there is not something wrong to talk to any one on the metaverse but, for me I avoid to have partners on the metaverse because I prefer to have a real life partner not a virtual one. This entry was posted in Start and tagged chat program, illusion, looking for love, metaverse, partnet, rl on January 23, 2012 by Xpontaneus.